NEW YORK (CNN) -- The first Guantanamo Bay detainee brought to the United States for trial pleaded not guilty Tuesday to charges related to two embassy bombings. Ahmed Khalfan Ghailani is the first Guantanamo detainee to be transferred to the U.S. for prosecution. Ahmed Khalfan Ghailani is charged with participating in the bombings of two U.S. embassies in Africa in August 1998. He has no attorney; military attorneys are helping in the transition. His next scheduled hearing is June 16. 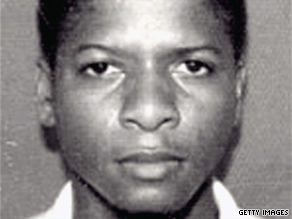 The Tanzanian national had been held at the camp in Cuba since September 2006. The transfer "sets a dangerous precedent for the more than 200 suspected terrorists currently held at Guantanamo Bay," Judiciary Committee ranking member Lamar Smith, R-Texas, said in a written statement. By bringing Ghailani to the United States, the Obama administration "is granting a terrorist and murderer additional constitutional rights," he said. "Even if convicted, Ghailani could be released in the U.S. after serving his sentence." He accused the administration of having "secretly transferred a known terrorist to the U.S. in the dark of the night without notifying Congress." Members of Congress were aware that the transfer was coming following the president's recent announcement, but they had not criticized the move publicly until now. In addition, transferring prisoners at night is a standard security procedure used by the U.S. Marshals Service when the prisoners are suspected terrorists. The 1998 embassy attacks are among several crimes for which Ghailani has been indicted in New York. He was captured in Pakistan in 2004 and taken two years later to Guantanamo. The 1998 bombings killed 224 people, including 12 Americans. Ghailani was transferred from the custody of the U.S. Department of Defense to the Southern District of New York by the U.S. Marshals Service. He was in custody at the Metropolitan Correctional Center, which has housed numerous terrorism suspects over the years. Ghailani faces 286 counts in the indictment against him. to kill Americans anywhere in the world. He also faces separate charges of murder for each of the 224 people killed in the U.S. Embassy bombings in Tanzania and Kenya and other offenses related to the bombings. "With his appearance in federal court today, Ahmed Ghailani is being held accountable for his alleged role in the bombing of U.S. Embassies in Tanzania and Kenya and the murder of 224 people," U.S. Attorney General Eric Holder said in a statement. "The Justice Department has a long history of securely detaining and successfully prosecuting terror suspects through the criminal justice system, and we will bring that experience to bear in seeking justice in this case." CNN correspondent Deb Feyerick and Justice Department producer Terry Frieden in Washington contributed to this story.